Thank you to Frederick Peel, Project Manager at The Tavistock and Portman NHS Foundation Trust for describing how he embedded the use of the THRIVE needs-based groups into care plans for children and young people in their CAMHS services. In the summer of 2016, The Tavistock and Portman NHS Foundation Trust set their CAMHS teams a target to ensure care plans were in place for 80% of their children and young people by April 1st 2017. For the first time, these care plans included a space to enter which of the THRIVE needs-based groups best described the person’s needs; Getting Advice, Getting Help, Getting More Help or Getting Risk Support (Wolpert et al., 2016). We spoke to Freddie, the Project Manager, about the steps he took to successfully reach this target. The target was to have 80% of care plans completed by April 1st 2017. The percentage applied to all children and young people (CYP) under the age of 18 who had attended an assessment. The decision about which THRIVE needs- based group a child or young person is in is made collaboratively between the young person and their clinician and discussed in the Multi-disciplinary Team. Training was required to ensure that clinicians had sufficient understanding of the needs-based groups. A quality improvement handbook about the THRIVE framework was created for staff which included brief descriptions of the THRIVE needs-based groups. Freddie attended team meetings with two resident THRIVE authors, Rachel James and Sally Hodges, to give clinicians the chance to ask questions and clarify any issues. GETTING ADVICE is for CYP and families adjusting to life circumstances who have mild or temporary difficulties, where the best approach is a brief intervention of 1-2 CAMHS appointments, with the possible addition of self-support via online or other resources. GETTING HELP is selected for CYP and families who would benefit from focused evidence based treatment with clear goals and the review of progress towards goals. On average 10 appointments would be offered, but the range would be wide, e.g. 1 year of weekly psychotherapy. GETTING MORE HELP is where the need is for intensive and potentially long term treatment, for example for young people with neurodevelopmental disorders, psychosis or emerging personality disorder. It is recognised that a significant number of CYP and families receiving Getting More Help are not benefiting from treatment but are being held in the CAMHS service solely because of concerns about risk and safeguarding. Such cases should be considered for Risk Support. GETTING RISK SUPPORT is where CYP and families are unable to benefit from treatment but they remain a significant concern and risk. Anticipated outcomes are realistically conservative, and there needs to be close interagency collaboration, which includes CAMHS as part of the network. The CAMHS role is usually one which supports the system. One is transparent with families that this is the approach that is being taken. Conversations about the differences between the THRIVE categories continued throughout the project. Freddie explained that there was initial scepticism by clinicians, some of whom felt anxious about co-designing the care plan with a CYP and their families. This anxiety was eased by highlighting that to some extent clinicians always discuss the options with the CYP and by writing the care plan this makes the process more explicit and efficient. Freddie created a monthly report on the percentage of care plans that had been completed so far, which was broken down by team. This was sent out to every CAMHS team at the Trust. Teams who had completed a high percentage of their care plans were congratulated. Freddie says that a sense of competition between teams helped to motivate them to complete more care plans. This feedback was provided on a weekly basis to staff towards the end of the project in order to keep up momentum. Freddie found that there were large differences between teams in the rate of their progress throughout the project. Some teams steadily increased the proportion of care plans they completed throughout the project whilst other teams steeply increased the proportion of care plans completed in the last couple of months. 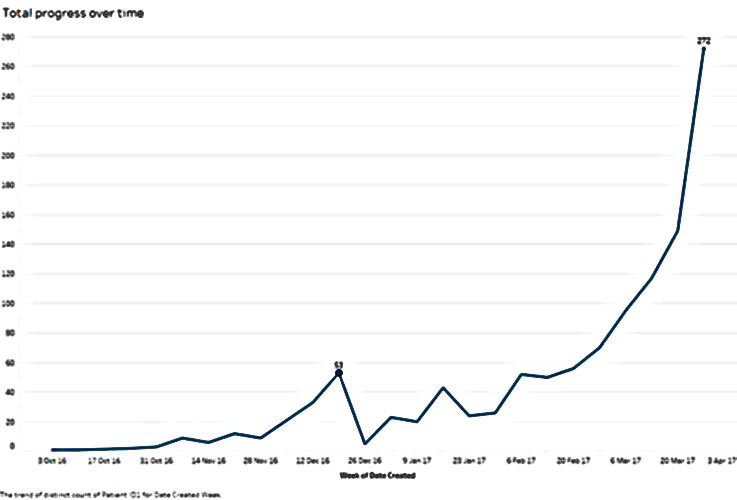 This can be observed in the graph below which depicts the number of care plans completed over the course of the project. The 1000+ care plans which had been submitted with the THRIVE needs-group information were reviewed to get a sense of the proportions of cases seen in each group. 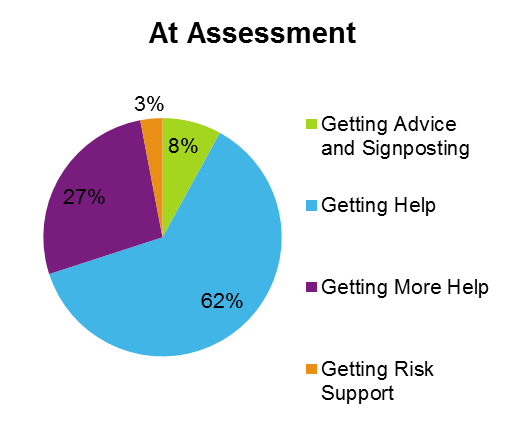 As you can see in the pie charts below, a larger proportion of cases than expected were categorised as ‘Getting More Help’ at review, as opposed to at initial assessment. 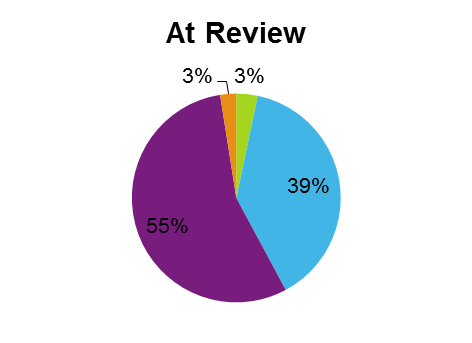 It is unlikely that 55% of cases at review are ‘Getting More Help’ so this raised a Quality Improvement issue regarding the consistency of clinicians’ use of the THRIVE categories and highlighted the need to raise staff awareness of the distinctions between categories.